WHISPER it but it looks like common sense is about to break on the European Tour. 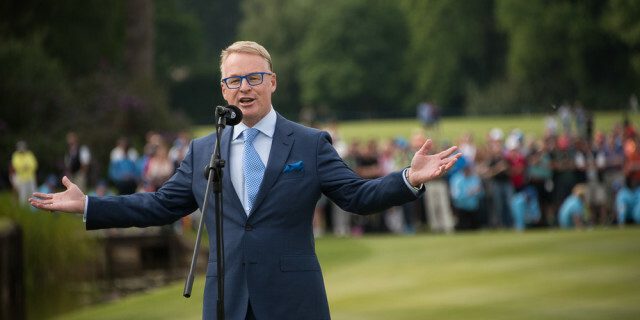 After another weekend in which a tour pro fell foul of new rules that were meant to make life easier for everybody who plays golf, chief executive Keith Pelley has issued a statement in which he says that he believes a two-shot penalty imposed on Li Haotong at the Dubai Desert Classic was unfair. The Chinese golfer was in position to finish third and thought that he had done so until he walked off the 72nd green and was informed that he was being penalised two shots. The reason? His caddie was standing directly behind him as he took his stance on the green. Li, who won the event last year with a tournament record score of 23-under, thought that he made made a birdie but it turned out to be a six and it dropped him from third to 12th. He was assessed a two-stroke penalty after officials determined that Li’s caddie was on a direct line behind the ball when the golfer took his stance on the green. Somewhat ludicrously, he would have avoided the penalty had he backed off and taken his stance again. According to the USGA and R&A one of the new Rules of Golf states that “the player’s caddie must not deliberately stand on or close to an extension of the line of play behind the ball for any reason” once the player begins taking a stance until the stroke is completed. However, no penalty is given out if the caddie does so by accident rather than as trying to help out the player. The USGA and R&A also say that allowing a caddie to stand behind a player and help with their stance “undermines the player’s need to use his or her own alignment skills and judgment.” It has to be said that Li’s caddie clearly played no part in helping his player to line up the putt. But the rule are the rules! Nevertheless, the two-shot penalty dropped Li nine spots from third to 12th place. A third-place finish would have earned Li £115,000. Instead, his 12th-place finish gave Li £39,000, so it turned out to be an expensive mistake - and one that he won’t be making again. Li finished the round at 1-over 73 and at 14-under for the tournament. To make matters worse, his tournament scoring record was broken by Bryson DeChambeau, who won with a score of 264, 24 under par, as he recorded his first victory on the European Tour. The decision infuriated a number of Li’s fellow professionals, who described it as ludicrous. Among the most vocal was Eddie Pepperell. Pelley issued a statement in which he said: “There has been much discussion and comment over the past 24 hours on the two-shot penalty given to Li Haotong on the 18th green at the Dubai Desert Classic. Let me state that under the new rules of golf the decision made by our referees was correct, under the strict wording of the rules. It is my strong belief, however, that the fact there is no discretion available to our referees when implementing such rulings as this is wrong and should be addressed immediately. The R&A, in turn, have responded with a statement of their own, Martin Slumbers reiterating that "there is no discretionary element to the rule." With regards to Pelley, it seems, we have somebody in a position of power who seems to understand how ludicrous golf can make itself look at times. Watch this space, as there is sure to be more on this continually evolving topic.